Dr Ahmed Al-Ghoul is an Ophthalmic surgeon specialized in the field of cataract and corneal Surgery. A native of Saskatchewan, Dr Al-Ghoul completed his medical degree and Ophthalmology residency training in Saskatoon. He subsequently completed a fellowship in the field of cornea and anterior segment surgery from the prestigious University of Pittsburgh Medical Centre (UPMC). Dr. Al-Ghoul is duly certified to practice in both Canada and the United States as he obtained both his FRCSC (Canada) and Dip ABO (USA) certifications. 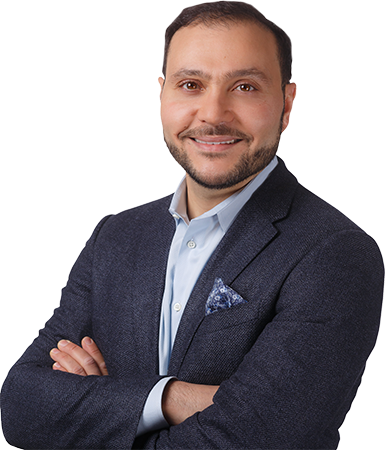 Dr. Al-Ghoul accepted a position in Calgary in 2007 as a corneal specialist with the hope that he will be able to bring in new technologies to Calgary and Alberta. With that in mind, Dr. Al-Ghoul was the first corneal surgeon to perform Descemet Stripping with Automated Endothelial Keratoplasty (DSAEK) in Calgary. Since then, Dr. Al-Ghoul has been honored to teach several of his surgical colleagues in the city and abroad how to perform this technique and has recently modified the technique so that it is performed through a clear corneal incision without sutures. This new technique has been presented at various international meetings and continues to be of interest by surgeons worldwide. Dr. Al-Ghoul was the first to perform Deep Anterior Lamellar Keratoplasty (DALK) in Calgary, which is one of the most sophisticated Ophthalmic procedures to date. He continues to perform this highly intricate procedure that has proven to be superior to traditional corneal transplant techniques. Dr. Al-Ghoul is also considered a leader and expert in the field of Corneal Cross-Linking (CXL). He was the first doctor to introduce this procedure in Alberta after having trained directly under the guidance of Dr. Theo Seiler from Switzerland the original pioneer of this procedure. With already 80000 CXL procedures done to date globally, this technique has proven to be very effective in halting Keratoconus and Ectasia conditions. In addition to the above corneal procedures, Dr. Al-Ghoul performs limbal stem cell transplantation, Pterygium surgery, and Keratoprosthesis. As a Cataract surgeon, Dr. Al-Ghoul has become one of the busiest cataract surgeons in the country having performed thousands of cataract surgeries to date. His superb care and attention to detail is evident in the outcome his patients receive and enjoy. This outcome is also made possible by integrating the latest diagnostic and surgical technologies at Seema Eye Care so as to achieve the best possible vision for patients. Dr. Al-Ghoul has expertise in all the intraocular lens options available for patients with Cataracts (Standard, Toric, Multifocal, and Accommodative intraocular lenses). Innovation is something Dr. Al-Ghoul always aspired to achieve in the hope to improve outcome for his patients. This began early in his career when in 2006 he invented a device to allow improvement in tissue delivery during Descemet Stripping with Automated Endothelial Keratoplasty. This device has been provisionally patented and presented world wide. It has received numerous accolades internationally and Dr. Al-Ghoul received an award for his invention in 2008 at the American Society of Cataract and Refractive Surgery annual conference. Dr. Al-Ghoul continues to work on other devices in the hope to improve the technique and outcome of corneal transplantation. From the clinical perspective, Dr. Al-Ghoul developed an innovative concept of making a personalized educational DVD that is provided to patients who are requiring cataract surgery in the hope of alleviating their concerns and providing a thorough understanding of what cataracts are. This unique DVD concept has proven highly effective for patients and is becoming used by other surgeons as well. In addition to his passion for clinical care and innovation, Dr. Al-Ghoul is a researcher and teacher through his appointment at the University of Calgary. He continues to be actively involved in research projects in the field of corneal cross-linking, corneal transplantation, and cataract surgery. His research findings have been presented both nationally and internationally at many reputable Ophthalmology conferences and he continues to travel and present his research findings. For his research, he has won several awards and recognitions. He also has authored several Ophthalmology book chapters in the field of corneal disease. Dr. Al-Ghoul is currently a member of the Royal College of Physicians and Surgeons of Canada, Canadian Medical Association, The Cornea Society, College of Physicians and Surgeons of Alberta, Canadian Ophthalmological Society, American Society of Cataract and Refractive Surgery, and the Eye Physicians and Surgeons of Alberta. When not working, Dr. Al-Ghoul enjoys martial arts, trekking in the Canadian Rockies, and travelling around the world with his family.